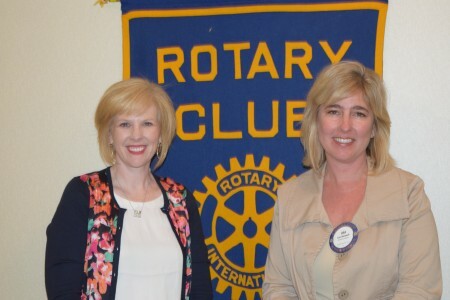 On August 6, 2014, Auburn Rotarian Lisa Ditchkoff, owner of the Event Center Downtown, shared moving stories of hope drawn from her life and book entitled, The Girl with the Caterpillar Eyebrows: Survival. Resilience. Triumph. Pictured are Kathy Powell (left) and Lisa Ditchkoff (right).